The Sense 46 promises a unique experience on board. Intelligently designed and unmatched in comfort, this sailing yacht does away with many of the constraints of cruising to make it fun and easy to sail. This is the new way of sailing. The Sense 46's architecture is completely new and organized to create continuity between indoor and outdoor activities. 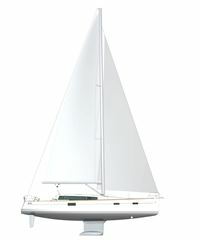 Perfectly designed, her hull makes her remarkably stable and yet she does not compromise in speed under sail. 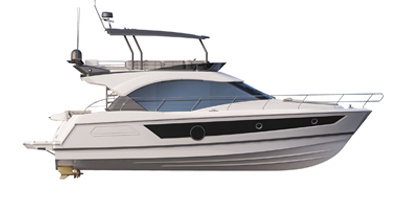 She is open to all the pleasures of the sea, thanks to a jack-assisted stern transom that lowers fully and two helm seats which lift like a draw bridge. She only has three steps to enter the interior space. This is bathed in light streaming in through the best openings ever seen on a cruiser. The lines of her design are clean and the fittings have clever functions. The saloon is a genuine living room. The master cabin has an ensuite bathroom fitted with a separate shower. The island bed is a luxury in this category second to none. The layout of the Sense 46 fittings is a distillation of design and ergonomics. she is ideal for safe ocean-cruising and for sharing all this pleasure in total freedom. By lowering the cockpit table, this space can be turned into a huge sun-lounger. By simply lifting the helm seats, a passageway to the swim platform is cleared. Lowering or rising, the transom closes off the cockpit for safe sailing. The central piece of furniture edged with stainless steel fiddles has an extra double seat inside for the saloon table. It also houses a retractable 32” television on a motorized lift-system. It gives you support in the galley when the boat heels and provides an additional grab rail on board. B&G electronics pack, instrument panel at each helm station: Housing for 9" plotter in addition to repeaters (options). Twin steering station, helm seats that lift to free the passageway to the swim platform. Removable panel at the bottom of the cockpit, which is used as a transom to close the cockpit. Modular table to create a huge sun-lounger in the cockpit. Large hull portholes provide more light and an extensive sea view. Master cabin: island bed with marine mattress and slatted bed frame (2 m x 1.60/1,60 m), lots of storage, TV 22" (options). Ensuite bathroom. Bright guest cabin: Large double bed with marine mattress and slatted bed frame; lots of storage (drawers, hanging lockers, wall cabinets) and an ensuite shower. Built in fitted long galley. Attractive grey synthetic resin worktop. Master suite with ensuite bathroom, guest cabin with ensuite shower, an additional extra toilet for day-time use. Very comfortable companionway: 3 steps lead to the saloon (instead of the usual 5), sloping at an angle of 45°. Maximum use of space: bench seating 6 people at table, also used as a seat for the chart table. The luxury saloon table (option) can be folded and lowered with an manually controlled command.